The Democrat party and the LEFT has become more and more intolerant and violent. As reported at the WAPO, during a campaign stop in McDonough, GA, former Obama attorney general Eric Holder altered former first lady Michelle Obama’s 2016 slogan, “When they go low, we go high” and in steads stated the new Democrat slogan is … “When they go low, we kick ‘em.” So this is what the Democratic Party is about these days? You kick them, seriously? And we wonder why individuals are being bullied in restaurants and on the streets and people receiving death threats. And this guy was the chief law enforcement officer under Obama? Doesn’t that explain a lot. I guess we can be assured the Democrats will never go high again, as if they ever did. Rasmussen Reports Daily Presidential Tracking Poll: President Trump at 50% … 5 Points Higher than Obama at Same Time … Approval Up Among Hispanics!!! According to the recent Rasmussen Reports Daily Presidential Tracking Poll, President Donald Trump is at 50%. And amazingly Trump is trending upward. This is almost hard to believe seeing that the liberal MSM has reported over 90% negative stories on Trump. This is even higher than media darling Barack Obama at the same time of his presidency, 5 points to be exact. Who would ever have thought that after the constant barrage of negative reporting and refusing to report positive news of the Trump presidency that Trump would be at 50% in any poll? Blue wave, really? The American people are seeing the truth for themselves and are realizing Donald Trump really is making America great again, and disregarding fake news. The latest figures include 35% who Strongly Approve of the way Trump is performing and 41% who Strongly Disapprove. This gives him a Presidential Approval Index rating of -6. Even more amazing is a little reported factoid of how Trump is actually gaining support among Hispanics. As stated in a recent Harvard/Harris poll, President Trump is gaining do to a stunning 10% rise in approval among Hispanics. Oh how the LEFT, Democrats and Never-Trumpers must be losing their minds over this one. This will cause them to become even more insane with TDS, Trump Derangement Syndrome. And why are Hispanics liking Trump, just take a look at the record low Hispanic unemployment rate in July 2018. Actions speal louder than words, so do jobs and take home pay over media babble. 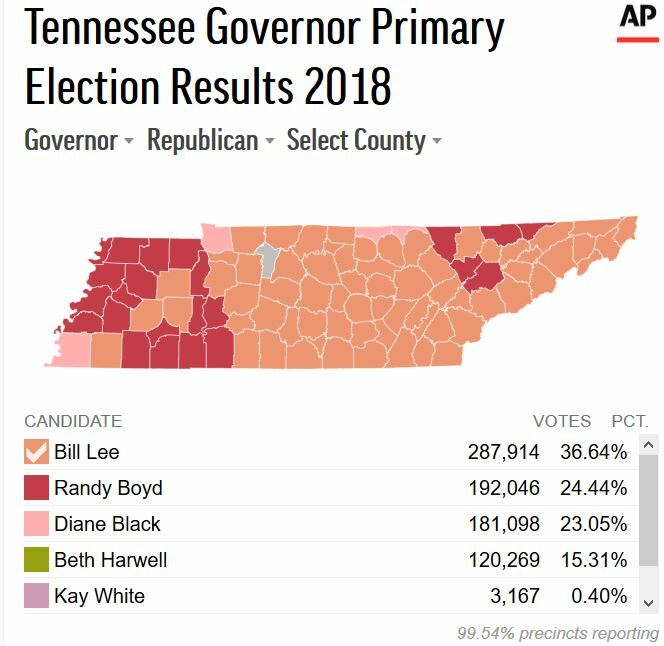 Tonight business man Bill Lee won the Tennessee Republican Governor primary by nearly 100,000 votes. Lee garnered 37% of the vote in a crowded primary defeating the likes of Randy Boyd, Diane Black and Beth Harwell. Bill Lee ran his campaign the right way and won the election the same. He never went negative, even though some of his opponents did so in a disgraceful manner. Hmm, a business man pulling off a Cinderella type upset in a political election, sound familiar? It should. 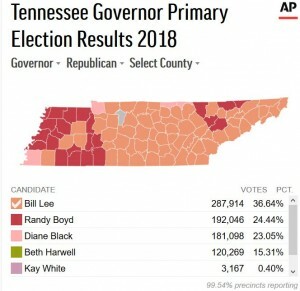 The Volunteer State voted Donald Trump in as president in 2016, look for the folks in Tennessee to do the same in 2018 for Bill Lee in the governors race. He is a great businessman, a man of deep religious faith and conviction, and a good man. In arguably the biggest Cinderella story in Tennessee Republican politics in decades, Williamson County businessman Bill Lee on Thursday secured the GOP nomination for governor. Lee bested a formidable field of opponents that included U.S. Rep. Diane Black, Knoxville entrepreneur Randy Boyd and House Speaker Beth Harwell. Republican Bill Lee and Democrat Karl Dean to face off in the Tennessee governor race this November. Democrat Karl Dean has a tough row to hoe as the votes just don’t seem to be there to win a general election against Lee. Tennessee has decided. Businessman Bill Lee and former Nashville Mayor Karl Dean will face off in the race for Tennessee’s next governor. Lee topped U.S. Rep. Diane Black, ex-state economic development commissioner Randy Boyd and state House Speaker Beth Harwell in a race that cost more than $45 million. Much of that money came from the candidates themselves. The candidates painted themselves as the most devoted to President Donald Trump and his tough-on-immigration priorities. They questioned each other’s allegiance to the president and his policies. Lee called himself the race’s only conservative outsider and focused heavily on his Christian beliefs. He ran ads saying attacking him isn’t what a leader does and some people will say or do anything to get elected. Lee heads his family’s mechanical contracting, facilities and home services firm. This is only the beginning for Bill Lee. You heard it hear. One day this individual will be running for president.